Sable had three babies Monday morning. Two of them are black, like her, and the third is dark also but grey with some white stripey looking things. Pretty much they’re all adorable. The dogs have been really good with them and Sable, surprisingly, doesn’t mind letting them get near the babies. We plan on finding new homes for all the kittens, but I know it’s going to be tough for me to let them go even though I know I don’t want any more goddamn cats. I love kittens but notsomuch owning cats. 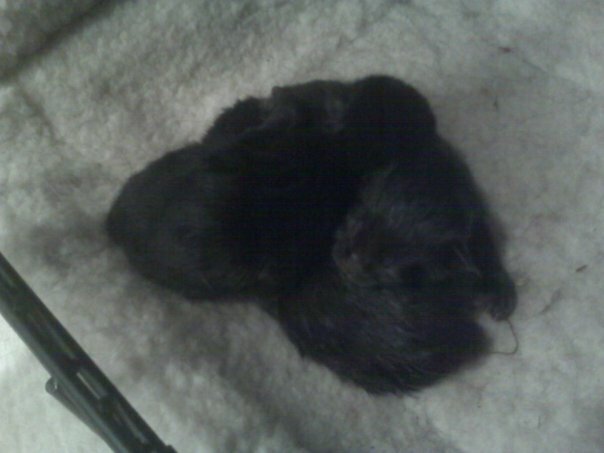 One of the black ones has a really short, fat, stubby tail – Pete made a comment that it looks like a beaver’s tail. Or maybe he said otter? I don’t know, I wasn’t really listening. The other black kitten has a more normal looking tail. I’m glad their tails are different or I’d never be able to tell them apart. The grey one is the biggest kitten of them all, which is kind of weird to me (but maybe it shouldn’t be?) because it was the last one born. Pete made a joke that the grey one is the size of the two black ones combined, but he was exaggerating just a bit. May I have one? SOOOO CUTE especially beaver’s tail!!! Aww, sweet! Congratulations on the babies! There are kittens at my new home — they’re tucked right beneath one of the sideboards of my little cottage, and Lucy goes WILD whenever we go outside. Unfortunately, the momma cat doesn’t want to let us near, and maybe that’s for the best.